11 Commercial Real Estate & Properties in Lakemba are listed in 3 categories. We have 8 OfficesSale & Lease , 2 Retail ShopsSale & Lease and 2 Industrial Warehouses Sale & Lease . 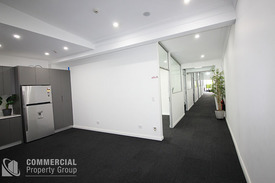 Renovated First Floor Offices - From $250 Per Week From $13,000 P.A. Gross +.. Brand new office available as one or separately from 18m² to 90m² approx. Features include: Modern designed entry for your business with main street access Newly painted fully carpeted Air conditioned offices Option to occupy the lot or separately Ample car parking behind premises Large shared kitchen Great semi outdoor area offering natural light Be quick as they will not last long!!! Close To Public Transport | Quiet Workspace | Economical Workspace $401pw | 5 Person Workspa..
PROPERTY OVERVIEW $401pw Price incl. Fully furnished and affordable private office space in Lakemba NSW! This furnished space is equipped with three desks, an A4/A3 printer/copier– and included is internet, are included so just bring your furniture, stamp your mark and get to work! Modern and fresh, this private office is available right now! Situated right next to Parry Park, this office is a perfect spot for those who love a scenic walk to work, a lunchtime in the sun or a PM outdoor workout. The office building sits on the corner of Punchbowl Road and Fairmont Street offering great exposure and prominence and both Lakemba station and Wiley Park station are in close walking distance for transport to nearby Bankstown or Sydney CBD. The building interior was recently refreshed to a great standard and features modern aircon and disabled facilities. The advertised office space is perfect for a team of 5. If you need more or less space, we have over 30,000 furnished workspaces all over the world suitable for a team of 1 to 200+. Our award winning team offer a free service that will help you find the perfect solution for your needs, so reach out if you need more help. What you get for your weekly rent , 24/7 Access , Access to kitchen facilities , Building outgoings included , Commercial grade internet , Electricity usage included , Flexible terms , Private Lockable Office Building features , Air conditioning , Open plan layout , Direct access to public transport however owner willing to furnish , Car parking Street / Public Car Park (Paid) , Direct access to train station Right next to Parry Park, great spot for lunch. Short walk to Lakemba Train Station 946 bus station right outside 3.5km from Bankstown 16.5km from Sydney CBD WHO IS OFFICE HUB? Office Hub has largest collection of shared office space, sublet office space, creative coworking office space and serviced offices, perfect for 1 200 employees. Let us take you on a tour of all the spaces that fit your needs and budget. Our service is complimentary and we work for you and the landlord to negotiate the most competitive deal in the market. Let us show you how shared and serviced offices can be the perfect solution for your business. All pricing shown excludes any local taxes such as GST or VAT Conditions apply A portion of the square meterage factors in access to shared space. The advertised price includes any incentives offered based on a 12 month agreement. If a shorter period is agreed to please note the price may increase accordingly. This promotional offer for new tenants only and may be withdrawn at any time due to space availability. Office area is carpeted with ducted air conditioning. Open plan floor layout with plenty of natural light. Wrap around balcony with direct access. Located on the corner of Lakemba Street & Croydon Street. 200 metres to Railway station and bus stop. 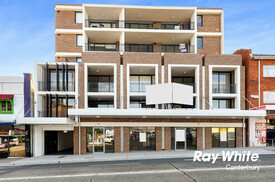 Stone throw away from retail shopping precinct. Signage opportunities available. Secure parking available by negotiation 4 Star NABERS rating areas of 184m², 463m² & 647m² available Available now! All dimensions and figures are approximate. Unless stated, all prices quoted are exclusive of GST.